Secretary of State Alison Lundergan Grimes expanded her sway over Kentucky’s election process with audacity, a willingness to fight — and a board that didn’t appear to be paying close attention. But the conflict isn’t over. This story, the second of a three-part series, was co-published with the Lexington Herald-Leader. The September 2018 meeting of the Kentucky State Board of Elections was strikingly contentious. There was shouting, cross-talk and threats to eject staff — all playing out in a public forum in front of TV cameras. But the most unusual moment, perhaps, was this: Two board members moved to rescind the votes they had cast at the previous meeting, only three weeks before. 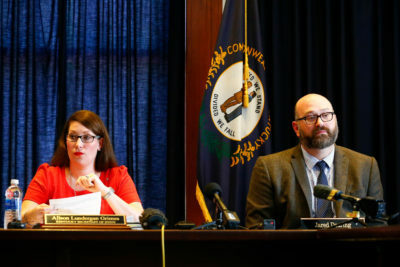 They claimed that Kentucky Secretary of State Alison Lundergan Grimes, whose position also makes her chairwoman of the State Board of Elections, or SBE, had essentially misled them into granting her unprecedented day-to-day power over the SBE. The board members’ efforts to void the resolution failed. Grimes cast the deciding vote. Meanwhile, Grimes has slowed the process of cleaning the state’s voter rolls. That could put Kentucky out of compliance with an agreement it signed with the U.S. Department of Justice to improve the accuracy of its rolls. In an interview, Grimes denied the state was out of compliance. Grimes asserts that as the state’s chief elections officer, it’s only natural that she exercises close control of both the secretary of state’s office and the SBE. She has cited the SBE’s resolution granting her day-to-day control of the agency as an endorsement of the breadth of her power. Consistent with the resolution and Kentucky law, Grimes has “taken an active role in the operations of the SBE,” according to a statement provided by her legal team. The statement denied that she has introduced partisanship into the SBE. Kentucky has long split election oversight between two agencies to reduce the possibility of partisan control, according to experts. The secretary of state manages the candidate nomination process, while the SBE handles almost all other state election functions, such as maintaining voter rolls and coordinating with the 120 county clerks in the state who oversee polling sites. Three state agencies are now investigating what multiple SBE staff members have called a “power grab” by Grimes. The investigations largely originated with complaints by those staffers, who charged that Grimes was encroaching on the SBE’s responsibilities. One aspect of the secretary of state’s response to the investigations suggests how closely the agency oversees the SBE: An assistant secretary of state, Erica Galyon, requested the right to sit in when investigators question SBE staffers, as did Luke Morgan, a lawyer that Grimes retained to represent the SBE. The power struggles have led to a stalemate. SBE staff is unwilling to trust the secretary of state’s office, which they’ve been told to report to, and Grimes has been stymied in her attempts to remove the SBE’s two top executives. SBE employees say Grimes’ team is controlling even basic tasks. For example, they say they’ve been barred from meeting with third parties — including the Department of Homeland Security, which regularly assists states with cybersecurity services — without consulting the secretary’s office. The SBE has been barred from having staff meetings without someone present from the secretary’s office. The SBE is also no longer allowed to handle its own public records requests. Document requests made to the SBE for this article were decided by the office of the secretary of state. Grimes’ attempts to expand her power first surfaced publicly in the fall of 2017. That’s when Matt Selph, then assistant executive director of the SBE, filed a complaint against her to the SBE. Among other things, it detailed a litany of ways in which he claimed Grimes and her team were increasingly asserting control over the SBE: insisting on approvals of new hires and even that Grimes’ office had to vet any correspondence between SBE staff and the organization’s board. Complaints about Grimes cycled back into view in late August 2018. Jared Dearing, a Democrat who Grimes had selected as executive director of the SBE, filed a complaint that was strikingly similar to Selph’s. Grimes snapped into action. She called an emergency meeting of the SBE for the next day, Aug. 28. At the meeting, most of which was closed to outsiders, she and Dearing squared off against each other, trading heated arguments as the board members watched in stunned silence. Eventually, Dearing was asked to leave the room. After he departed, Grimes continued to assail him at length, using words she has repeated to the media multiple times since, that he has a “fundamental misunderstanding” of her office’s statutory authority. Her extended criticisms of Dearing left the impression that Grimes wanted him ousted, according to a person with close knowledge of the board. The emergency meeting ultimately lasted six hours. Before it ended, Grimes took one more step that would spark a controversy. Having grappled directly and indirectly with Dearing over the extent of their respective sway, Grimes insisted that the board needed to at least reaffirm her powers. Weary after the hours of combat, the board decided to “pacify” Grimes, according to the source with knowledge of the board and multiple others who have spoken to board members, by adopting a resolution that reaffirmed her powers. They viewed it as a harmless step. The vote was 4-0 (two board members were absent and the chair tends not to vote unless there is a tie). But two of the four who voted would almost instantly regret their actions. Only three weeks later, the board reassembled for a regular meeting, with a full complement of six members and the chair present. Republican members DeAnna Brangers and Josh Branscum attempted to rescind the previous vote. It was too late. The effort to rescind the vote split along partisan lines and Grimes cast the deciding vote against the motion. Since then, she has repeatedly pointed to the disputed resolution as proof of the board’s confidence in her. That confidence isn’t universal. In late September, the Kentucky County Clerk’s Association presented a letter signed by all 120 clerks in support of Dearing and Jennifer Scutchfield, Dearing’s second-in-command. Kenny Barger, the Republican clerk in Madison County, co-authored the letter with a Democratic clerk. “It comes to a breaking point sometimes, where you just have to call it and speak out,” he said. Clerks have begun calling board members to express concern. Many interviewed for this article contend that Grimes has damaged the relationships between her office and the clerks, people she has little authority over but whose cooperation she and the SBE need to implement statewide programs. Grimes is term limited as secretary of state — her tenure runs out at the end of 2019 — and clerks hope her replacement will be less controlling. Another point of controversy has been Grimes’ handling of a federal order regarding voter-roll maintenance. SBE board members and staff argue that she has prevented the board from complying with the order. Grimes has long opposed what she refers to as “purges” of the voter roll. Like many Democrats, she views them as attempts to suppress voting. In the wake of a June 2018 Supreme Court ruling that granted Ohio the ability to remove people’s registration if they skip voting for several elections and fail to respond to a mailer, Grimes said she would never remove Kentuckians from the rolls for that reason. At the time, Kentucky was already under fire for improper list maintenance. In early 2018, the Department of Justice joined a lawsuit against the state filed by conservative activist group Judicial Watch. The DOJ alleged that, since 2009, Kentucky had violated federal law by failing to send postcards to verify that voters’ address records are up-to-date and accurate. The lack of checking, the DOJ claimed, resulted in a voter roll with numerous incorrect entries. The state signed a consent decree on July 3 that committed Kentucky to implementing the address-checking process now and in the future. The process has revealed a significant number of outdated registrations. Almost 300,000 postcards have been returned as undeliverable, suggesting that those voters do not live at those registered addresses. That’s equivalent to about 8 percent of registered voters in the state. But no further actions have been taken, and some staffers and board members believe that’s intentional. Dearing’s complaint alleges that the day the consent decree was signed, Grimes insisted he stop the address-checking process. 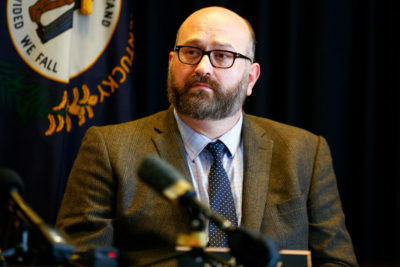 A week later, after Dearing complained about the legality of the request, according to the complaint, then-assistant secretary of state Lindsay Hughes Thurston told him and Scutchfield they could restart, but they were to “slow walk” the process. Morgan, the lawyer Grimes retained for the SBE, responded to the DOJ letter, asserting that the Justice Department had in fact approved a delay in order to ensure no voter was unfairly disenfranchised. He has since claimed the same to board members, and emails show at least one board member has asked Morgan to send proof that the DOJ made such an agreement. To date, Morgan, who did not respond to a request for comment, has not done so.